Multiple state reports by the Attorney General’s Office, the Health Policy Commission, the Center for Health Information and Analysis (and its predecessor the Division of Health Care Finance and Policy), and the Division of Insurance have examined the factors driving health care costs. These reports represent some of the most comprehensive analysis on market trends and health care cost drivers anywhere in the country, with each report utilizing the most recently available data at that time. 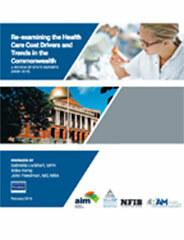 Report after report has found that provider prices remain the most significant factor driving health care costs. Provider price variation in Massachusetts is more extreme than nearly all other U.S. markets. Disparities grow as providers consolidate and volume shifts to higher cost providers, resulting in higher health care costs for employers and consumers. The review examines how market-based efforts have fared and suggests potential short-term regulatory efforts to address this issue. Over the last nine years, more than two dozen state reports have examined the factors behind rising health care costs in our state. This analysis highlights common findings among state agency reports, concluding that provider prices remain the most significant factor driving health care costs, challenging the affordability of health care for consumers and employers and the state’s ability to meet the cost benchmark.